Normally on the first Tuesday night of every month we have Show and Sell and celebrate Birthdays! We invite direct sales reps to come between 6:-6:15pm to set up and show their wares until 7:25. (a round table will be provided at no charge) The chorus rehearsal begins at 7:30 pm. The Direct Sales rep can either stay, listen, participate (if they have been voice tested) and share some birthday cake - served at 10pm OR she can pack up and quietly leave. 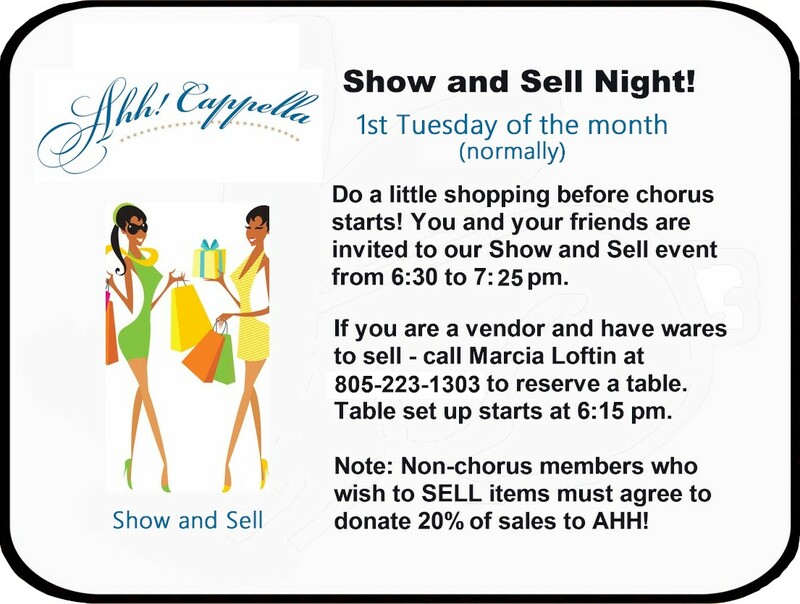 We ask direct sales reps to make a donation of 20% of their sales that evening to the Agoura Hills Harmony Chorus. (AHH!). To be scheduled and request a table at our Show and Sell event - contact Marcia Loftin.